An excursion that takes you out onto the frozen glacial tongue of Solheimajokull, this is the opportunity for visitors to Iceland to experience a hike over the surface of a glacier itself. Accompanied by an expert guide, guests will be equipped with crampons, which will be used to hike up onto the ice field. Here, a wonderland of natural ice sculptures, ridges and crevasses await. 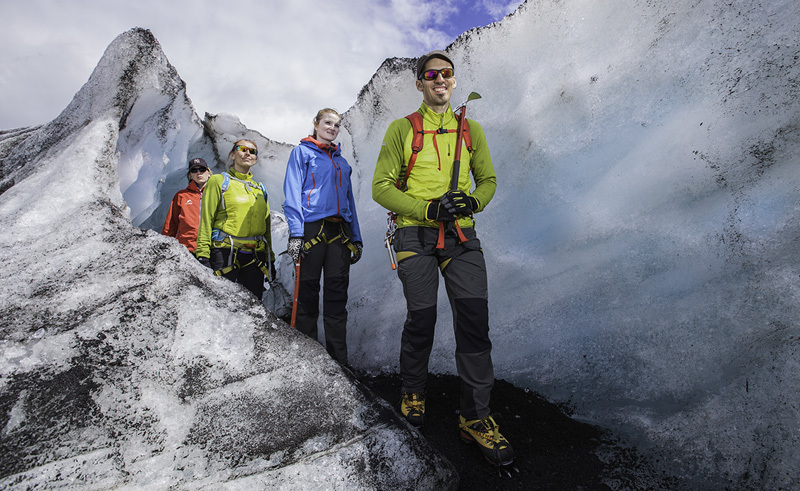 Guests will spend approximately 2 hours on the glacier and all glacier gear and safety equipment are included. We ask that you bring warm clothes, rain gear and hiking boots. A stop will be made en route for you to buy lunch to take with you on the excursion. This tour is available with transfers from Reykjavik or make your own way to the Solheimajokull car park. Please note that the minimum age is 14 years. See plenty of Iceland, whether by car or by foot. This self drive short break is ideal for those keen to explore and truly savour the iconic Golden Circle. This go-slow fly-drive links just three special locations in Iceland, allowing you to unpack, relax and enjoy a trio of exceptional countryside hotels. This easy going self drive showcases the south's spectacular natural wonders.